What's stronger? Free will or fate? It's been a month since Kayla, a headstrong ruin rat, and Carl, an OmniLab trader, returned to the surface. After she helped to restore control of the towers to those who would look after the best interests of the people, she'd found herself irrevocably bonded to Alec, the new co-leader of the High Council. Okay. I just couldn't wait. After reading The Two Towers, the first book in this series, I simply HAD to read this second book. And I was definitely NOT disappointed. Everything I loved about the first book was back again in this second book, and now I cannot wait to read the third book in this series! 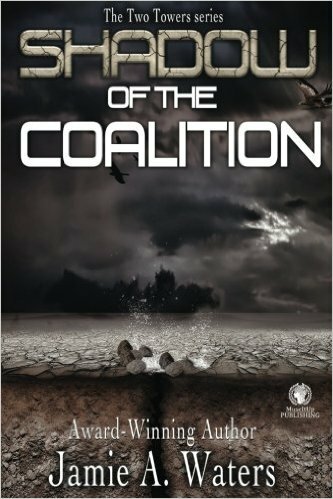 By the way, I strongly suggest that you read Book #1 of this series before reading Shadow of the Coalition (Book #2). 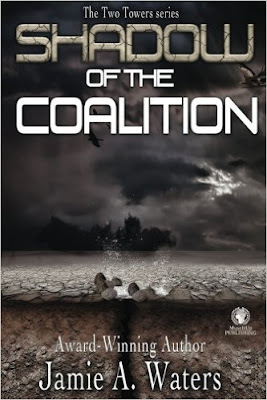 Shadow of the Coalition starts off with Kayla back in the ruins, but what she finds this time may have an impact on the future survival of everyone. I love the natural chemistry that sparks between Kayla and Carl and yet I'm still fascinated with that bond she has with Alec. Some new characters are introduced in Shadow of the Coalition and although Jamie Waters did an excellent job developing these new characters, I'm hoping to see more of them in her next book. Wow! More twists and turns and action and hot romance! One thing is for certain... these books are not predictable. You never know what is going to happen next. But whatever it is, you can be assured that Jamie Waters will make it flow together into a storyline that will leave you wanting more. As I said in my review of The Two Towers, Book #1, this story simply demands to be made into a movie! Fans of Firefly and The Hunger Games will definitely agree with me!